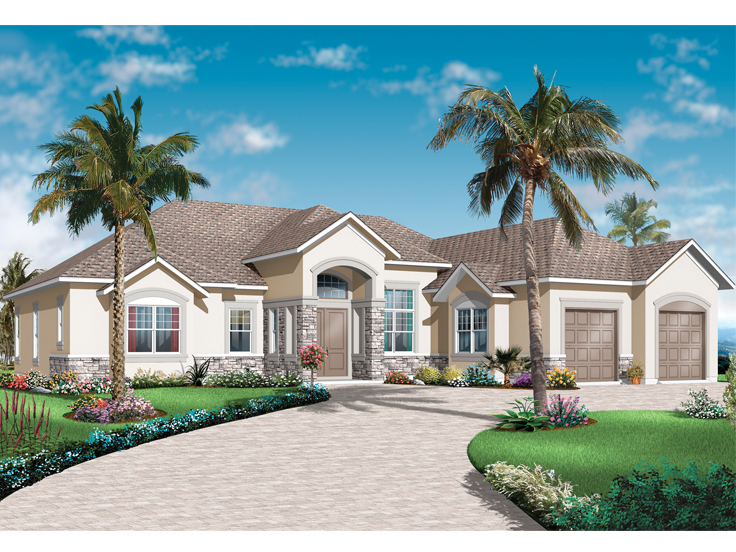 Do you like Florida-style house plans? Consider a Mediterranean house plan or a Sunbelt Home plan. These thoughtfully designed house plans offer all the features you love like open floor plans, tall ceilings, decorative details, and practical elements like a kitchen snack bar and a large, master walk-in closet. The three plans below are just a sampling of the Mediterranean and Sunbelt house plans we offer. Take some time to review these plans or continue your search by viewing our entire collection of Mediterranean house plans or Sunbelt home plans. 027H-0379: The multi-material exterior intensifies the fresh, up-to-date design of this Mediterranean house plan. Its open floor plan provides the convenience of everyday living, all on one level. Enjoy meals in the dining room, breakfast nook or at the kitchen island snack bar. Gather around the living room fireplace or catch the game on the television in the family room. Delight in the outdoors on the comfortable screen porch. Mom and Dad are taken care of in the master bedroom featuring two walk-in closets and a master bath with separate tub and shower, twin sinks, and a compartmented toilet. On the other side of the house, the children’s rooms share a Jack and Jill bath with two sinks. A two-car garage protects the family vehicles with space for the lawnmower and lawn tools. 037H-0137: Imagine coming home to this incredible dwelling with its hint of tropical living, and its definite abundance of amenities. Pulling into the motor court there is a choice of a garage on each side. Inside you will find an open floor plan with a plush living space full of interesting angles all around, and special ceiling treatments above. The sumptuous master suite contains the mother of all walk-in closets with a tremendous capacity to hold an extensive wardrobe. Two secondary bedrooms both have full baths, one of which doubles as the pool bath. Even with its lavish display of interior space, the focus turns to the outside. Enter the covered lanai through double doors from three different vantage points and enjoy. An outside kitchen provides sustenance for family and guests as they delight in their open-air freedom. 070H-0009: Though small in stature, this Sunbelt house plan begins with a most intriguing covered front porch whose front door is at a jaunty angle next to a bay window. Enter the foyer and notice the room to the left. It can be utilized either as a bedroom or a study/home office depending on your needs. Pass another bedroom on the right and proceed directly to the combined dining and living areas. This open floor plan offers all the necessary living spaces in a most direct and efficient way. Rounding out the plan is a master bedroom with a walk-in closet, a laundry room, and a two-car garage. But wait, there’s more. A covered lanai presents a most comfortable way to enjoy the outdoors. Carefully designed home has lots to offer while fitting a narrow lot. 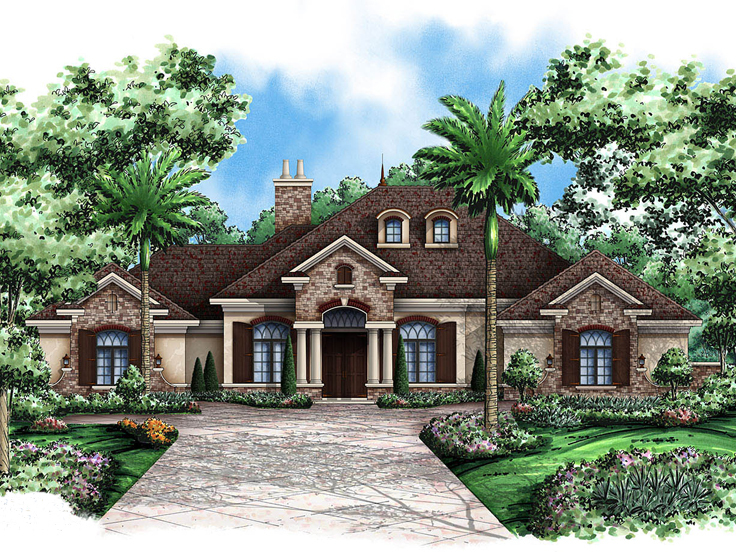 Characteristic of the Mediterranean region as well as the southern states such as Florida and even some regions of California, this Mediterranean house plan boast many recognizable exterior features. Begin with the eye-catching red clay tile roof and the stucco façade. Then notice the arched windows and decorative wrought iron enhance the second floor window/double doors. From the neatly detailed exterior to the elegant and spacious interior, this one-story home plan delivers sophisticated family living. Interesting angles and large windows contribute to a unique yet comfortable atmosphere. Upon entering, a roomy foyer greets all. It quickly introduces the formal gathering spaces where you’re sure to host dinner guests and entertain family and friends on holidays. The dining room features a decorative ceiling treatment and stylish columns defining the space while maintaining openness to the living room where large windows and double doors deliver views of the rear yard. Now pay attention to the causal family spaces that team up to create an open area for daily activities and family time. Two islands are better than one in the well-appointed kitchen where you’ll also discover a culinary pantry, eating bar, abundant counter space and adjoining nook. The family room connects with the kitchen and nook showcasing a fireplace flanked with built-ins. Along with the nook and formal dining room, you’ll find another option for meal time when you take a look at the sweeping covered patio, complete with outdoor kitchen, perfect for summertime barbecues and cookouts with the neighbors. Three family bedrooms and two bathrooms (one can serve as a pool bath easily accessed from the patio) accommodated the children’s needs on the right side of the home. These bedrooms are shielded from street noise by the three-car, side-entry garage and laundry room. Don’t miss the bonus room above the garage, ideal for a home theater or game room the whole family can enjoy. On the left side of the home, Bedroom 2 delights in a bayed window and enjoys access to a nearby bath. This arrangement is ideal for weekend guests or an aging family member in your care. Your master bedroom is secluded for privacy and loaded with amenities. You’ll love the bayed window and luxurious bath delivering pampering features like His and Her walk-in closets, soaking tub, separate shower and dual sinks. 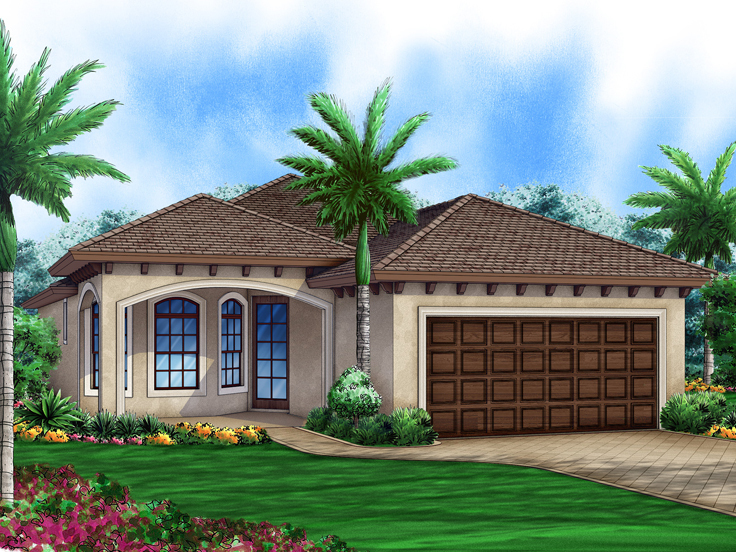 Designed with plenty of room for everyone and stylish features that are sure to charm you, this Mediterranean home plan is mixes the best of both worlds – comfortable living and elegant design. 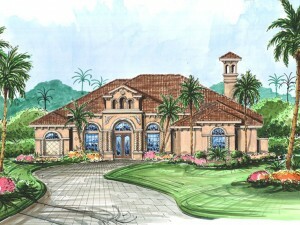 For more information about this Mediterranean house plan, please visit our website. Or browse our entire Mediterranean collection for more options! Commonly designed for warmer climates, these homes are predominantly found in Florida and California as well as other southern states. 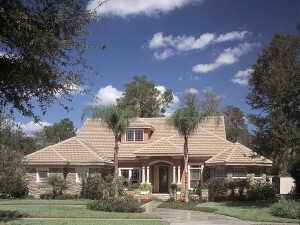 Sometimes referred to as Floridian house plans, Sunbelt home plans or stucco homes. Usually designed with one level although it is not uncommon to find a two-story Mediterranean house plan. Designed to maximize energy efficiency in warmer climates and feature a white or pastel color stucco façade and a red clay tile roof that hold up well in warm weather regions. The exterior features wide overhangs designed to block the sun’s rays from windows and entries keeping the interior as cool as possible. Floor plans feature generously sized rooms, open gathering spaces and tall ceilings promoting and open and airy feel. Decorative features include arched entries and windows, wrought iron railings, fences and gates, and stylish columns which define individual spaces while maintaining openness with other areas of the home. The living areas are often arranged around an open courtyard or pool for entertaining purposes. Large outdoor living spaces such as verandas, patios, terraces promote relaxation. Two-story versions often feature balconies. If you’re looking for a home plan that delivers a masterful blend of comfort and elegance check out our Mediterranean house plan collection and Sunbelt home plans. Mediterranean homes are considered beautiful and elegant by many. To achieve an exquisite exterior look that is sure to catch the eye of passersby, it is important to understand what makes these homes POP with curb appeal. If you are building with Mediterranean house plans consider these tips to achieve a stunning exterior look. Mediterranean homes found throughout Spain, Italy and Greece feature a stucco façade painted in a light color, such as beige or a pastel hue, due to warm temperatures and sun exposure. Brightly colored, red clay tile roofs accent the light color façade with eye-catching magnitude. Wrought iron gates and railings are characteristic of Mediterranean homes. Incorporate brightly colored, hand-painted patterned tiles or mosaics in a square or round shape above the entry door, on the side of the home or on stepping stones in the garden or courtyard. Seek professional help to come up with a good layout for your garden and the landscaping surrounding your home. Include lush green plants that are suited for your geographic region such as palm trees, jasmine bushes and other rich foliage creating a striking contrast between the light colored walls and the healthy green plants. Incorporate an herb garden into your landscaping with herbs and spices you will use in your favorite Spanish and Italian dishes. Create a path through your garden and to your front door with stepping stones such as limestone. When it comes to building a home with Mediterranean house plans it is important to know how to compliment the exterior and achieve stunning street appeal. These tips for exterior finish and landscaping are sure to make your home stand out among all others. You can find other ideas for decorating and landscaping a Mediterranean home by paging though magazines and looking at various online websites. To find a Mediterranean home plan that is sure to accommodate your needs and deliver an elegant feel and life style, take some time to visit The House Plan Shop.